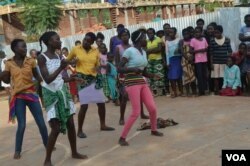 The management for the Jacaranda School for Orphans in Malawi’s commercial capital Blantyre recently hosted a party for its students as it closed for Christmas and New Years Day holidays. Around 500 people including students, staff members and others from surrounding areas attended the event, which was held at the school’s premises in Chigumula area. The party included gifts, Santa Claus, and a “dancing show case” by the students. The school management told VOA that the yearly celebration has been a school tradition for the past 13years. Jacaranda School students participate in "dancing show case." Deschamps, who is also an Honorary Consul of France in Malawi, said before the main event the patrons were treated to “a nice meal” from the students. “We had a big, big lunch with good meat and rice,[the dish made from maize flour called] nsima, of course, and vegetables. And it was the students themselves who cooked the meal for everybody, for over 500 people,” he said. She thanked the school’s management for hosting the Christmas party for students who in most cases do not have such celebrations at home. Another student Emmanuel Chisale said good meal aside, the event has taught him the spirit of sharing. “This party has brought a change in my life. I have learned that we have to have a heart for sharing one another as the Father Christmas was doing,” he said. 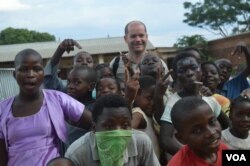 Founded in 2002, the Jacaranda School for Orphans is the only one in Malawi which provides free primary, secondary and tertiary education to children without parents. A Malawian woman, Marie Da Silva, started the school after she returned from the United States where she spent nineteen years working as a nanny.